Noho Miyagi (left) playing the role of mother in “Koukou no Maki,” a special Kumiodori performance to celebrate the 15th anniversary of the opening of the National Theater Okinawa. 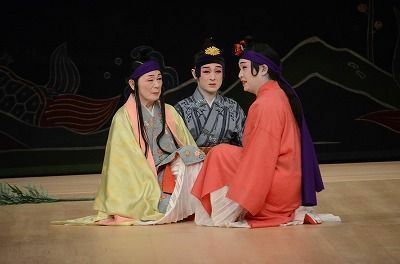 He performed with Yoshikazu Sanabe (right) and Shinji Kinjo (center), who were his students of kumiodori at the Theater, on January 13 at the National Theater Okinawa in Urasoe. One of the recipients was the Okinawan Kumiodori performer Noho Miyagi, 80, of Yonabaru, who is designated a Living National Treasure. It was the first time an Okinawan has received the award. Noho Miyagi was lauded for his “performative expression through masterful technique in Kumiodori and accomplishment in contributing to increased accession by young performers. ” The award ceremony will be held at the end of June at the Japan Art Academy in Tokyo. “I don’t know that I’m worthy, but I am truly honored. It is all thanks to my predecessors who toiled to pass down the performative tradition over the generations. I want to continue endeavoring to train young talent,” said Noho Miyagi. Noho Miyagi’s “achievement of a performance style which boasts the elegant beauty of the female role and the grace unique to the Okinawan performing tradition, and in which strength is beautifully hidden within delicateness” and his “dedicated efforts to cultivate young talent” were given by the Japan Art Academy as reasons for his selection. Noho Miyagi was born in 1938 in former Sashiki Village, now Nanjo City. His birth name is Masakichi Tokumura. He studied under Nozo Miyagi, the founder of his school of performance. He became a professor at the Okinawa Prefectural University of Arts in 1990, and took the title of visiting professor in 2004 and of professor emeritus in 2007. He has been the head instructor of Kumiodori at the National Theater Okinawa since 2005. 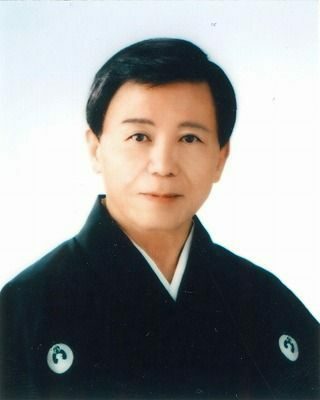 In 2006, he was designated a champion of the Important Intangible Cultural Property “Kumiodori performer” (individual designation)– a Living National Treasure. In 2009, he was designated a champion of the Important Intangible Cultural Property “Ryukyu dance” (group designation). He has been director of the Ryukyu Dance Preservation Association since 2015. He was awarded the Ryukyu Shimpo Award in 2013. He is head of the Miyagi Honryu Ohtori no Kai school of dance.